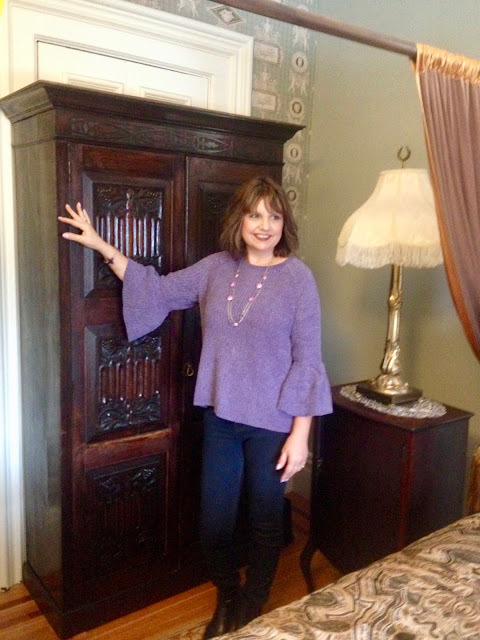 My husband and I celebrated our 30th Wedding Anniversary in August and our daughter and son-in-law gifted us with a free night at a Bed and Breakfast in Red Wing, Minnesota. We had so many of our weekends already booked in late summer/fall, that we decided to use the gift certificate as a Christmas getaway. It was a good idea because it allowed us to step away from the hustle and bustle of the holiday season and enjoy a relaxing weekend; plus, we got to see the B&B decorated for Christmas! It was a pretty cold weekend, so for the first evening I wore a new bell sleeve chenille sweater from JCPenney. This sweater is so soft, cozy, and warm. I am such a sucker for chenille and I am very grateful it has made a comeback. I echoed the color purple of the sweater in my jewelry choosing a lavender and silver necklace and a deeper violet bracelet. Bell sleeves are a huge trend this season, but I'm trying to hold back and not buy too much for I don't want a closet full of trendy blouses that are no longer of any use to me once they go out of style. So far I've only purchased this sweater and a dress with statement sleeves. 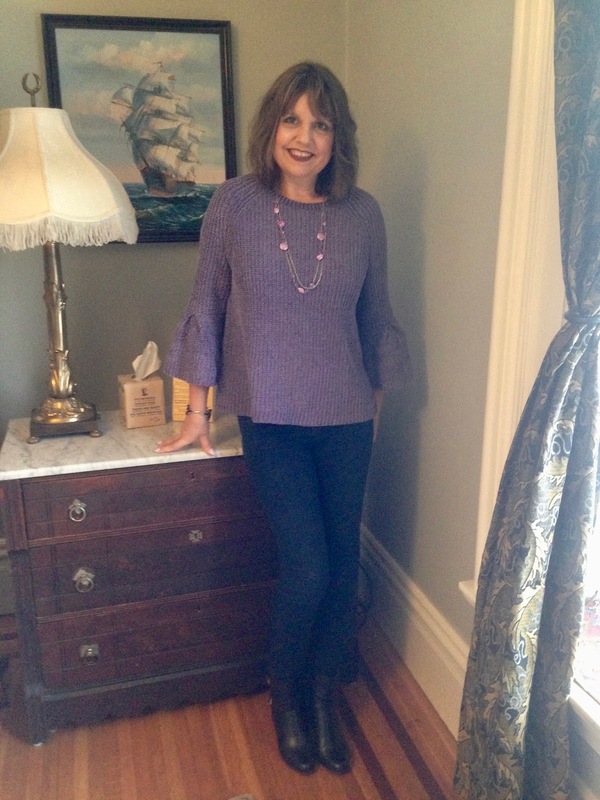 I paired my chenille sweater with a Kut from the Kloth jeans and black ankle booties. The bell sleeves are a 3/4 length, so they don't get in my way like a longer bell sleeve would. They style of the sweater is a bit square, and could add unwanted pounds to your frame, so I suggest sizing down if you purchase this sweater. I'm wearing a medium, but I probably should have bought a small. I ordered on-line and ordered a medium to be safe. The a.n.a 3/4 sleeve chenille crew neck pullover sweater is available in nine different colors. I'm wearing Violet Night. 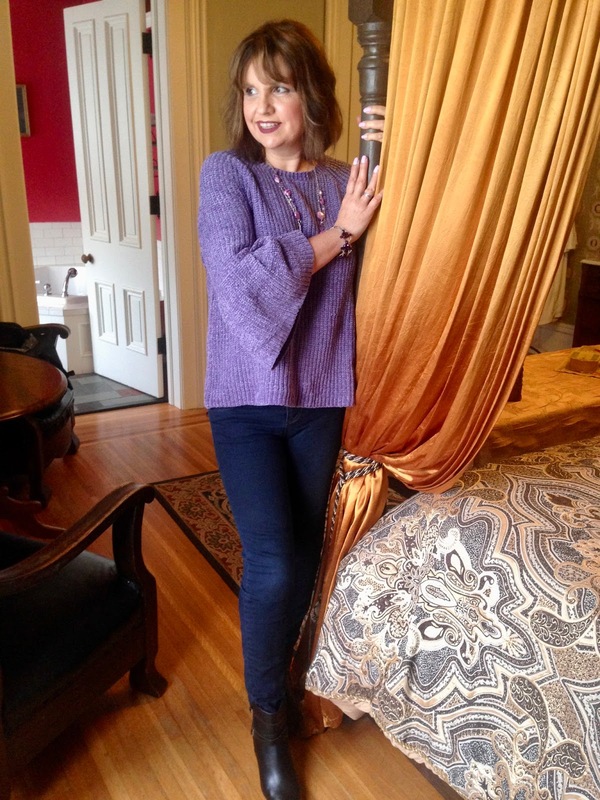 I will share more of our stay at this beautiful B&B on Wednesday's Travel Post. Amy, you look beautiful!!! The colour us perfect for you. Lucky you to have received that hotel break as a gift. Looking forward to seeing that gorgeous hotel on Wednesday. Hugs, x.
Awww, thanks so much. We had so much fun. It was very relaxing. Thanks Patti! I don't own a lot of purple, it's a hard color to find, but when I do people always say i look good in it. It must be one of my colors. Thanks so much! Christmas is a wonderful time to visit America! That color is so pretty! 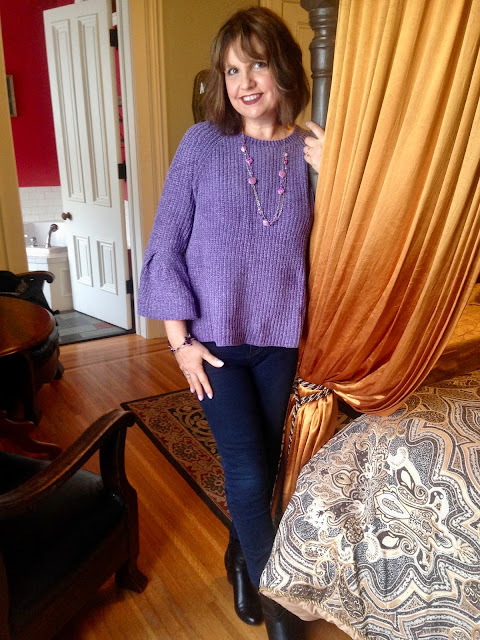 I haven't bought any bell sleeve sweaters, have a hard time getting used to anything not ordinary :-) so I am staying away. But that color is really tempting and it looks great paired with jeans (my favorite kind of pants). How nice to receive a gift certificate to a bed and breakfast! Thanks Elli, I so understand about the bell sleeves and thats why I've been holding back myself. Yes, the gift certificate was a wonderful surprise. That sounds like a great holiday getaway! 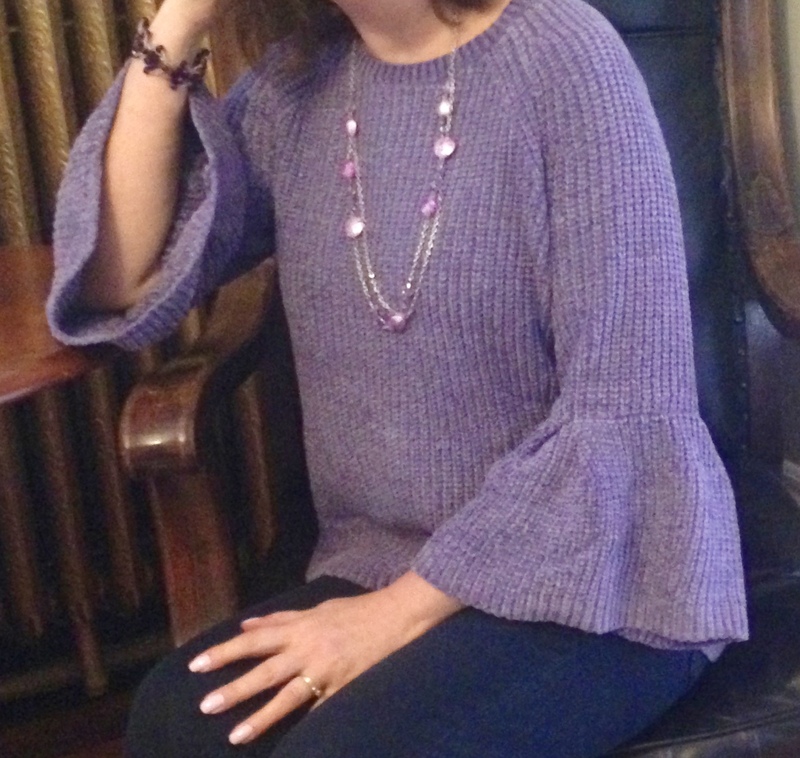 I love the purple sweater and those ruffled sleeves really are fabulous and trendy! It was wonderful, thank you Ruth! That is such a beautiful sweater Amy. It suits you so much. It good having stylish jumpers isn't it. My current post has a bell sleeved sweater in coincidentally too. Thanks Anna! I'll check it out! That sweater is beautiful and unique, love the color and of course the material. You always find the best things at JC Penney. Happy 30 years of bliss to you and your husband! That is amazing!! I'm a sucker for a good bell sleeve! Happy anniversary! Wow! Congrats on 30 years of marriage! This sweater looks absolutely gorgeous on you. I love the purple color, and the bell sleeves add such a feminine flair to the look. I would totally wear this. Happy Anniversary! I absolutely love that sweater! It's a gorgeous color on you too! Thank you Laura! I keep hearing that; purple must be my color! 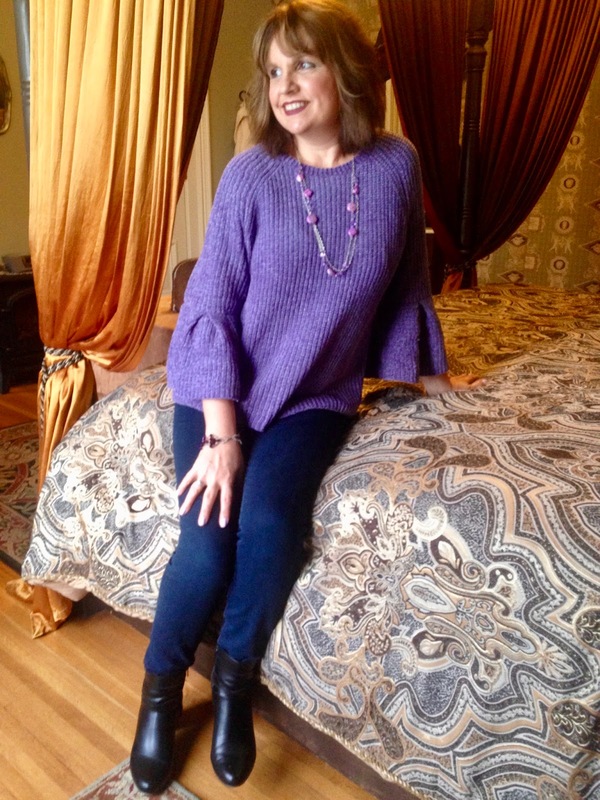 I love purple and it looks gorgeous on you Amy! The bell sleeves are so pretty and such lovely photos! Thanks so much, I think I need to buy more purple! I really like the sweater. The color looks stunning on you! I have one bell sleeve top and I enjoy it but the sleeves do get in the way, so I like that yours are a 3/4 length. Congratulations on your 30th wedding anniversary. Thanks Debbie! 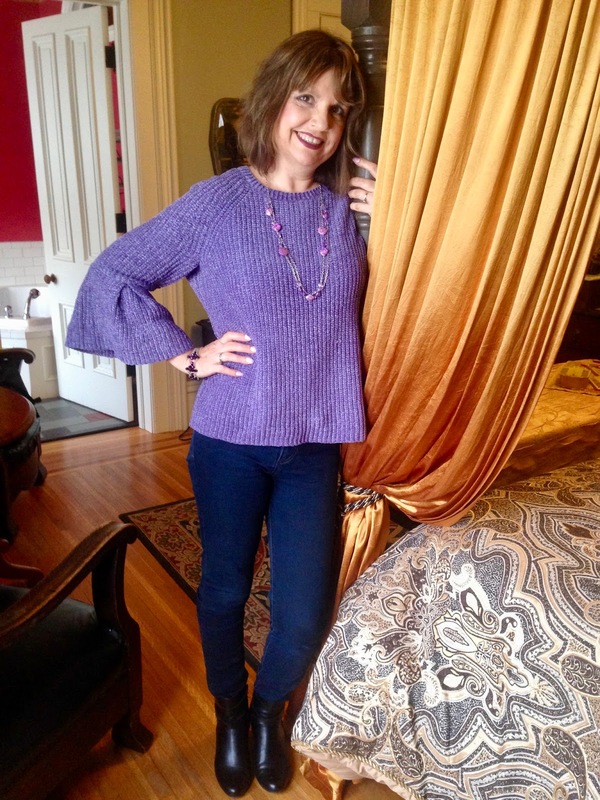 The 3/4 sleeve length is what sold me on this top! Happy Anniversary, Amy! I like how purple and dark blue colors look together. You look fabulous in this outfit! Thank you! 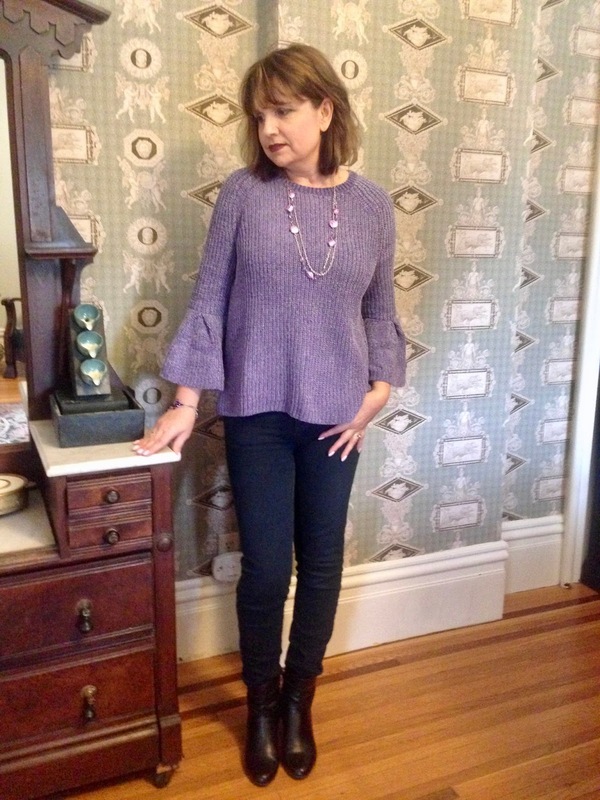 It was hard figuring out what bottoms to wear with this top and I felt the dark denim worked the best! Thanks for linking up to Top of the World Style. This sweater is a great buy. It's the color of next year. Thanks Nicole! I hope its the color next year, maybe I'll find more items in this color. I love the style of your sweater Amy, and gorgoues color on you! Amy I love this colour! and yes I too am so pleased its the new colour of the year for 2018! Thank you! I just found that out myself and was thrilled about it. It's the first color Pantone picked that I actually like! What a fun getaway! And this sweater is such a pretty shade!